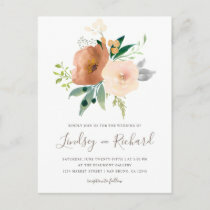 Unique rose wedding invitations + sets, Save the Date, thank you cards, magnets, stickers + more rose designs for classic wedding themes. Choose from many card sizes, personalize with photo names, date, location, message & other info, depending on design. Click on any image to search at Zazzle.